I can remember exactly how this felt: You said you loved me. In that moment I believed that you loved me. And yet – three seconds later – I had forgotten. Then I would ask you, “do you love me?” Repeat. In those moments, I wasn’t able to hold onto your love, because it was so unfathomable to me. I was unable to believe, on a fundamental level, that I was lovable. I was unable to believe this, because I had never looked upon my body with loving eyes, had never looked into my spirit to see the lively spark inhabiting my soul, or lean into the beauty of the full breadth of my heart. I wrote about this once before, in a post entitled On Loving Someone Who Doesn’t Love Themselves. To date, that post is my post popular post in four years of blogging. It is still found daily, by the beautiful and seeking souls who search for how to hold on when their loved ones don’t feel their love or those who don’t believe that they deserve sweetness from their partners. I get email about that post often, with people imploring, how can I make my partner realize that I love them? That they are lovable. These emails break my heart open, because the feeling of being so distant and so separate from the love all around me is both familiar and painful, still. It was as though I was wrapped up in a down comforter, far far from the compliments and love. Unable to hold on to the warmth of basking in the love that I so rightfully deserved, just for being alive. Or, sometimes, as though there was a cement wall between me and my partners, rejecting any kindness that came my way. I had bought into the idea that I was flawed. That I, unlike those around me, deserved a life of crippling self-doubt and heartache. That someone as ugly, fat, stupid, broken, and horrible as I believed that I was,was absolutely undeserving. That I should take what I was given – a caged animal tossed scraps to pacify it’s hungry, roaming heart. I would voraciously consume those scraps, so desperate for any shred of validation and love. I would put myself, again and again, at the mercy of hands unworthy of my body and spirit. Hands that hurt and hands that sought to smote the last little bit of brightness in my spirit, believing that this was the only thing in the cards for me. At that time, no amount of love could penetrate my defenses – no matter how pure and beautiful the spirit doing the loving. What was required was an absolute re-authoring of my beliefs. I took them apart one by one, deconstructing them, testing them for truth and ease, and reconstructing my spirit from the foundation up. What was required was the leaning in to the unknown of my own deserving – something that I didn’t have evidence for, other than the singular, quiet light burning deep in my heart. That light burned, holding the immense space for that which I was unable to believe possible – a life that was full to the brim with love, ease, and adventure. This post is not for those who are seeking to prove their love to their partners that are unable to feel it. This is a post for those who are shivering in the cold, isolated, and unable to receive the love that they rightly deserve. You are not irreparably damaged. This post is an invitation to you, to come in from the cold and begin the journey of learning how to love and trust your own spirit. This is an invitation to you to damn all of the gurus and experts, and warm yourself by the fire of your own inner wisdom. It is there that beginning of your journey back can be located. Follow the path, like Hansel and Gretel, picking up the trail of breadcrumbs. Allow the breadcrumbs to be the small things that light you up, the tiny moments of absolute bliss, the foods that warm your belly, the laughs shared, and the moments of heart-felt congruence with your spirit. Allow yourself to become heartier, more certain, as you move from breadcrumb to breadcrumb, a detective collecting evidence ofwhat turns you on like a mega-watt bulb. Allow yourself to take note of the beauty of your being, and begin celebrating the fullness of your humanity. You are not perfect, you will never be. But you are in the exact right place, in this time. 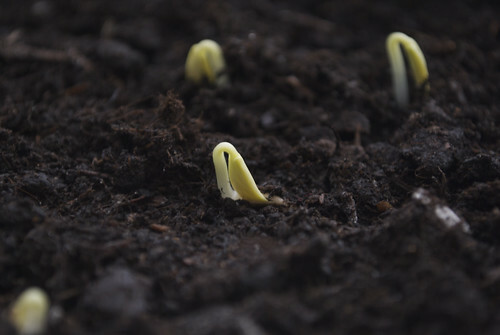 Allow your spirit to incubate, like a seedling protected by a hearty shell, until you are ready to germinate and begin your ascent toward the full warmth of the sun. Thank you for refreshing rain and being here! This is so articulate, thoughtful and full of love!